I first launched The Human, Earth Project after learning that my friend M had been abducted from her home, a town where I had lived in northern Vietnam. On my return to Vietnam this January, however, I learned M was not the only friend of mine who had fallen victim to human trafficking. M had been one of a group of ten teenaged girls, no less than five of whom had been kidnapped and sold into China. Two had since returned to Vietnam, one remained in China voluntarily, and two had not been seen for almost three years – for their protection, I refer to them as M and P.
P had been trafficked several months earlier than M, though her story was much the same. A Hmong man from a neighbouring region had deceived her, drugged her, and spirited her away on his motorcycle. After having been sold for marriage in China and having given birth to her first child, P was permitted the use of a mobile phone, with which she was able to contact her mother in Vietnam. While in China this April, Moreno and I cautiously made contact with P, painstakingly pinpointed her location, and were finally able to meet with her. (See the full story here). Although it would mean leaving her two young daughters in China, over the following weeks P made the difficult decision to return to her home, family and a life of her own choosing in Vietnam. I believed that P’s decision would be the most difficult part of the process, but there have been numerous unexpected complications and, this week, a great deal of drama. Since the very beginning of The Human, Earth Project, I’ve been working in cooperation with Blue Dragon Children’s Foundation. Blue Dragon are a fantastic Australian NGO based in Hanoi who list, amongst their many achievements, the rescue of hundreds of internal and international victims of human trafficking, including dozens of trafficked girls from China. Blue Dragon offered their services in bringing P home. Hers would be a relatively easy rescue, for three key reasons. Firstly, she had been sold as a wife, rather than a prostitute. Secondly, she was shielded by the anonymity of a large city, and had a great deal of freedom to move about. Finally, she could make and receive calls – in Hmong, Vietnamese, English or Chinese – easily and without any personal danger. Over the past months, Blue Dragon have committed their resources to larger and more urgent trafficking cases here in Vietnam. 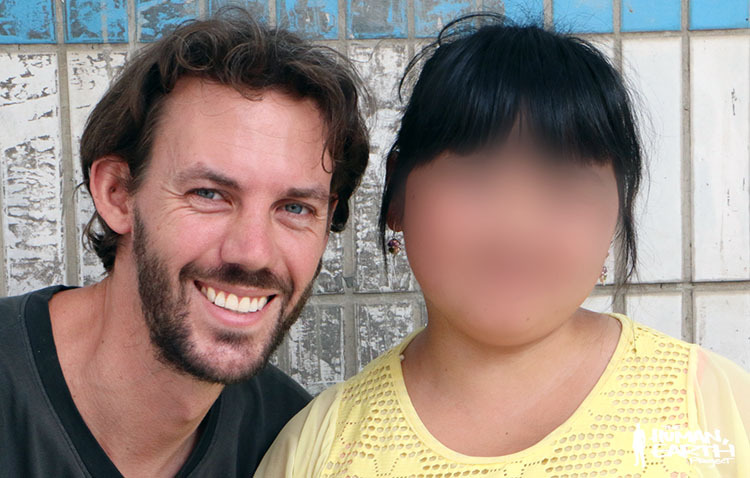 This week, however, one of Blue Dragon’s representatives found the time to cross the border in the hopes of rescuing a number of Vietnamese girls who had been trafficked to China. There was a surprise waiting for him in China, however. When he called P on Monday to arrange her rescue, she informed him that she’d already escaped. Two days earlier, P had left her children and travelled more than 1,500 km (nearly a thousand miles) alone across China. She had passed numerous internal checkpoints, despite having forgotten her illicitly-obtained Chinese identification card in her apartment. I spoke to P briefly on Monday afternoon. She’d had a problem with her phone, and had been unable to contact her mother, M, Blue Dragon or myself. It seems she simply couldn’t bear the uncertainty of waiting any longer. She’d heard stories of other trafficked girls who had returned home themselves, and decided to take matters into her own hands. At that time, from what I understood, she was in a Chinese Hmong village within ten kilometres of the border, and less than fifty kilometres from her home and family. It was an exciting moment – but not without danger. P was more vulnerable than ever, and she herself didn’t seem to appreciate the risk she was running. The border area is the domain of traffickers. An unaccompanied girl, cut off from her family and friends, makes an ideal target. P was alone in the lion’s den, and seemed utterly oblivious to the danger. Blue Dragon’s representative was highly concerned for her safety. He advised her to be extremely careful, and to trust no one. He offered to meet her and accompany her home. P, however, was quite confident of her return. She said she’d think about his offer, and would call him back. That was the last time anyone spoke to P. Her phone – her only means of contact – rings, but nobody answers. With every day that passes and P does not appear or make contact, hope of her return dwindles. There’s more to the story, of course – there always is. In this case, there’s a mysterious and suspicious Chinese Hmong man whose existence P had concealed from both myself and Blue Dragon, and whom I learned about only via M.
Amidst all the uncertainty of her life, P craved some assurance of security. It seems she was clutching at the hope of a new marriage with a man she barely knew – in other words, a trap identical to the first she’d stumbled into. It’s almost too tragic to believe that, having come so very close to home for the first time in the three and a half years since she was taken, P could have been snared once more by traffickers, but this now seems to be the most likely possibility. Sometimes, lightning strikes twice. This is the last photo we have of P, taken at our final meeting in April. Tomorrow I’ll take it to P’s mother in her village, and discuss the possibility of giving it to the police on both sides of the border. Blue Dragon have advised, however, that a successful search is extremely unlikely with what little information we have. It may be years before we hear from P again – if we ever do. If she is sold again, this time she may not be so lucky to be sold for marriage. I’m still processing the events of the past few days. There are times I almost think it’s P’s fault. She, of all people, should have known the dangers she was facing, the risks she was taking. But is it P’s fault she was born into a world where women are bought and sold, in an area plagued by traffickers? That China is tens of million of women short, and that she was sucked into the vacuum? That she was raised in a land where she could not hope to find romance or a trusting human connection without risking what little she had in life? All of the above was written on Wednesday evening. I delayed posting it to The Human, Earth Project website, pending approval by Blue Dragon. In the following twenty-four hours, the world turned again, and everything flipped upside-down. You’ll flip, too, when you hear what’s coming.